Just got back into the game after 2 and a half years, took me a few days to get used to it, wanted to know if this base layout is still alright or whether it needs improvements, changes, turret swaps etc. lemme know what y’all think, thanks. Last edited by bhavishya7 on Fri Mar 15, 2019 12:04 am, edited 1 time in total. Your link doesn't work. Please, fix it. mkenobi wrote: Your link doesn't work. Please, fix it. 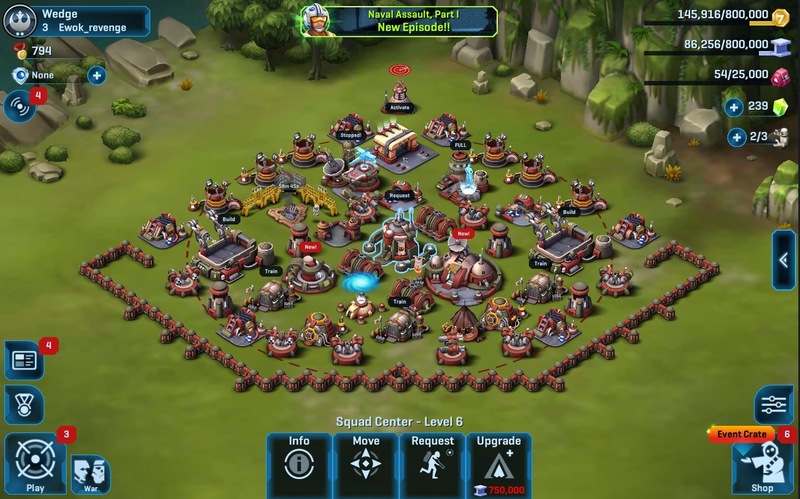 I think you should focus on getting your storages, turrets and HQ all clustered together under the shields. Also put your Squad Centre under the shields. Having your SC exposed (not under shields) is not a good idea. It makes it way too easy to take out with starships. Don't know if you stil are following the replies, but first thing is what you want to do? Win defenses in PvP or win defenses in Heroic Defense (HD)? With your current layout will be tough win on both. Second, change your layout to top north, just inverting it: the transports go to the bottom corners, and your base to the top north, in the classic "top north layout for HD". 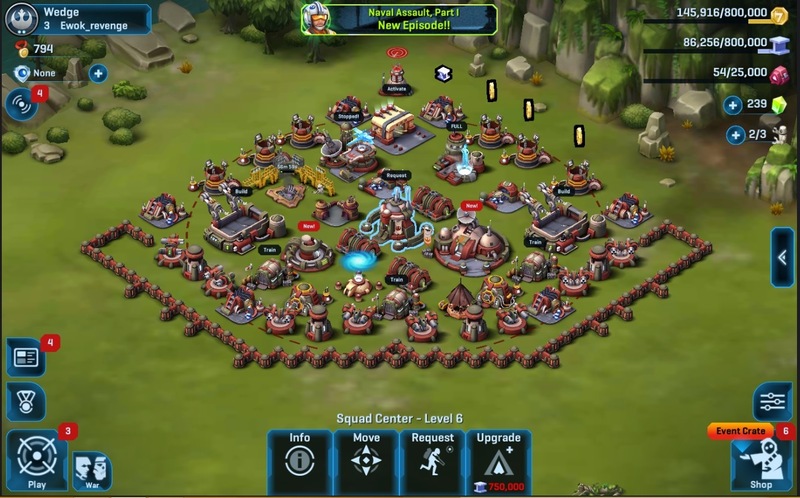 Notice that SC must be protected, under 3 shields if possible, and cover all perimeter to prevent troops coming from any side. 2 extra turrets at each side at north improve the defense, and turrets in line protected by walls will ensure you earn HDs. Move these 4 turrets in the north to reinforce the turret line at south if you are not strong enough to win the Bronzium crate in HDs. And more important of all: fill your SC with Prestige bikes if you don't have Jump skins for PvP. When you have jumps skin, request Jumps for your SC. 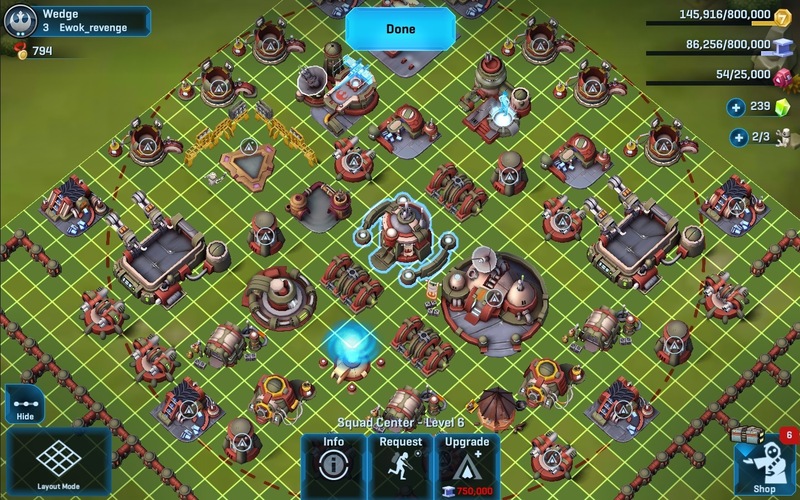 Maximize your turrets, walls and shields to improve your defenses, collect Armory frags for turrets and try to unlock some Guard Reserve also. You don't need to build/upgrade traps -- I don't have any trap in any of my HQ 6. This layout works great for HDs, PvP and Wars. I use them in my HQ 6 as Imperial and Rebel. Good luck! bhavishya7 (Topic OP) - Keep in mind the posted Screenshots are for a Rebel Base but the "Pattern" should work fine for a Imperial Base. mkenobi - I may have missed it but you did not describe "what changed" between PvP and HD in your posted Screenshots. "Notice that SC must be protected, under 3 shields if possible, and cover all perimeter to prevent troops coming from any side. 2 extra turrets at each side at north improve the defense, and turrets in line protected by walls will ensure you earn HDs. Move these 4 turrets in the north to reinforce the turret line at south if you are not strong enough to win the Bronzium crate in HDs."